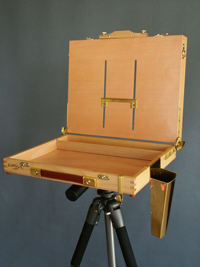 1 - PRO easel / palette combination box. 1 - Professional tripod TP-6777 comes with carry bag. If you already own a sturdy tripod , you may purchase the PRO box without the tripod. PRO Box only comes with brush holder and two hooks. The inner area of the palette space is: 11" x 14". Watercolor palette size should be equal to or smaller than the available area in order to put inside. Our AW-05 watercolor palette fits well. Supports panel as small as 4"x6" to 18" in height. Most flexible easel holding a variety of sizes: 4X6, 5X7, 6X8, 8x10,9x12,10x12,11x14,12x16,14x18.or any of your customized sizes without necessity of purchasing additional adapter(s). to adapt different panel sizes. is adjustable by sliding the panel support along vertical slots. artist's arm won't have the risk to touch the palette when painting or make your shirt dirty. unique feature is essential as artist will be able to adjust the height of panel/canvas to view the entire painted area properly (not by looking down at the painting). This is the only pochade easel which provides such feature in the entire market. The panel support has an inclined surface to ensure the panel/canvas is always pushed against the easelback, thereby the panel is held more securely. It can hold canvas up to 3/4" in thickness. This standard panel support is designed with 5/16" deep only so that during painting, it will not obstruct the flow of brush stroke. VERSA comes with this standard panel support which is lightweight. Storage for paint tubes, brushes and other supplies. EASyL-Pro has enough storage space for carrying most necessary supplies. Our Side Tray is also fit inside the storage. 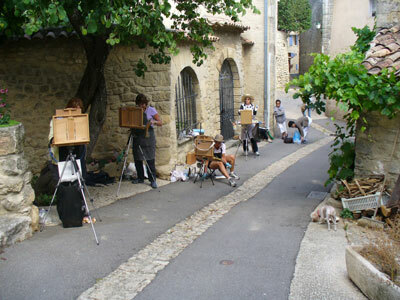 It is advisable to carry as less as possible in outdoor painting session. Extra supplies may be stored in the backpack or any other carrying facility. The reserved space separated by a removable separator bar is reserved for unused paint. The separator bar will be removed to turn the whole palette area into a color mixing palette. I have found the Easyl Pro to be the best equipment I have used for PleinAir Painting. It's size allows for carrying all the painting materials I use when doing plein aire paintings. It is well designed, light, and yet very sturdy. the "Paint the town" competition in St Pete April 7 thu 9th.2005. suitcase when traveling by plane also. I would suggest it to anyone. Just returned from Hawaii where I conducted a plein-air workshop. I'm sending photos with students and myself using the easyl lite. They all enjoyed using the easyl so much, it was very windy in some locations and the easyl was very sturdy. Thanks. A young talented South African wild life artist used the EASyL pochade and was reported in the local newspaper in 2006.